Last week, a reader asked about the large wooden "boxes" that they noticed in one of the photographs. I don't know whose brilliant idea these were, but they are one of the most useful and simply elegant pieces of equipment we have. Five of them came with the school when I was hired nearly two decades ago and a parent made us three more at my behest. They are constructed from plywood and are approximately 18"X24"X36". We call them boxes even though they have two open ends. Handles have been cut into the sides, making them convenient to move around. As you can see from the pictures, they are perfect for both kids and adults when a little extra elevation is needed. They also make nice, child-height impromptu tables that can be made be made as big as necessary just by adding more boxes. They are useful for temporary storage when tipped on end with one of the openings on top. And, of course, they can be called to service as seating when we run out of chairs. 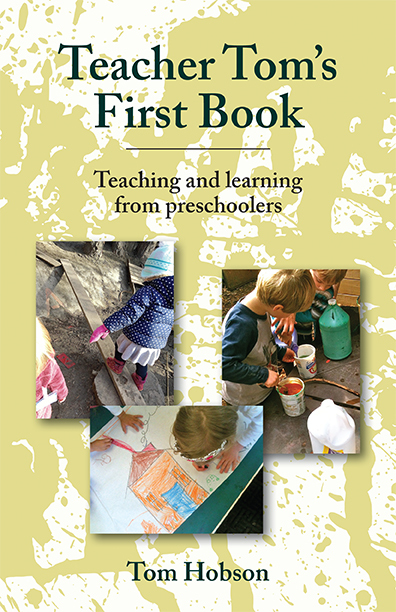 Naturally, the children find plenty of uses for the hollow interior, employing them as "homes," "forts," "caves," "garages," "bedrooms," or "tunnels." Sometimes we stack them two high to have an upstairs and downstairs. Many children over the years have found that they make convenient "escapes" when they need a moment of quiet isolation. I use them frequently during circle time as a platform for displaying something I want all the kids to see or for conducting science experiments, magic tricks, or for simply beating out a drum pattern. 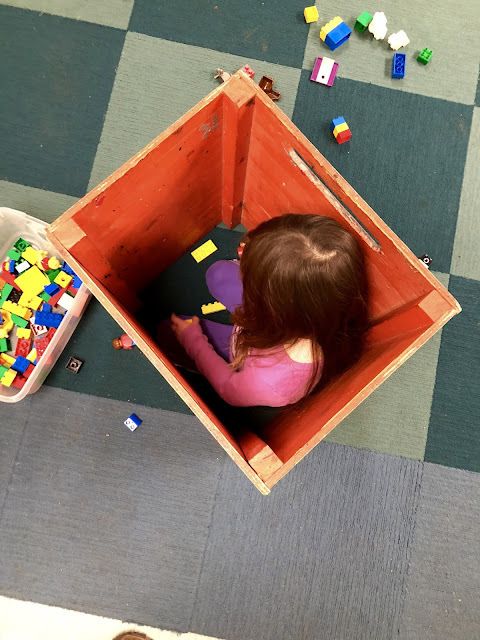 I'll call out, "I need one of the wooden boxes" and sometimes as many as a dozen kids will leap into action, working together to carry the heavy box to where I need it. Likewise, even kids who generally avoid participating in clean-up time will eagerly tackle the challenge of moving them back to their usual spots. 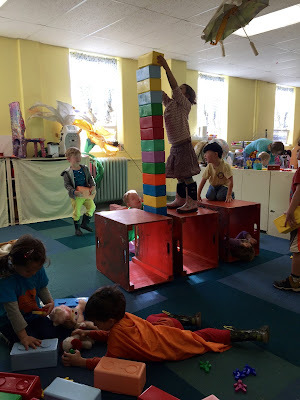 Sometimes the younger children will just spend a half hour moving the boxes from place to place with no objective in mind other than to move them from place to place. Their uses are endless. Frankly, I can't imagine living without them. "Don't Play With Your Food!" "Only Little Dinosaurs Can Come Into Our House"
"If I Only Had Two Blocks . . ."
A Wall To "Keep Others Out"